When he learned he was under criminal investigation by the FBI, Turing Pharmaceuticals CEO Martin Shkreli could have kept a low profile and gone to the Caribbean. Instead, he went on CNBC — and kept himself in the media spotlight for months. Shkreli, who was arrested Thursday morning on securities fraud charges, has effectively waved a red flag for months in front of federal prosecutors, keeping himself in the media glare with a hugely controversial price hike of a drug that benefits AIDS patients, pregnant women and cancer patients, attacking his critics, including presidential contender Hillary Clinton, and lighting up Twitter with outrageous statements. In doing so, the 32-year-old Shkreli acted contrary to what most criminal defense lawyers and public relations managers recommend for someone in the cross-hairs of a United States attorney's office. "I would think that members of his legal team and the communication team would advise him not to do the things that he has done, particularly in light of an ongoing criminal investigation," said Judy Smith, a PR crisis management expert who represented President Bill Clinton's former mistress Monica Lewinsky. "Most people that are aware they are under a criminal investigation would not behave in such a public way," said Smith, whose career inspired the hit ABC series "Scandal." "The risk of it is that it attracts and invites attention, review and investigation of ongoing business practices in a very public way, quite frankly." In other words, could Shkreli get himself in even more trouble? "Exactly right," she replied. Shkreli's attorneys, Marcus Asner and Baruch Weiss, "are not commenting," a spokesman for their firm, Arnold & Porter, said in an email to CNBC. The spectacle that Shkreli created around himself and his company Turing Pharmaceuticals since late summer, even as the criminal probe proceeded, raised the question of whether he had any idea of the risk he was running — or whether his conduct was part of a plan to beat the rap in Brooklyn federal court and generate business. 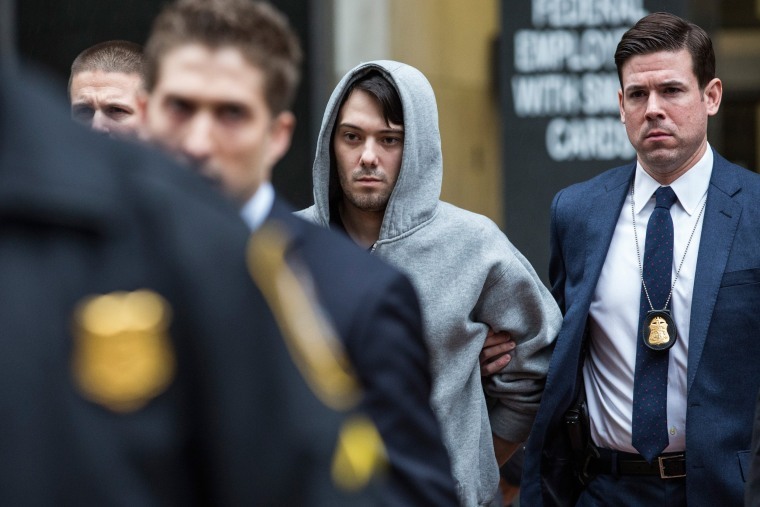 Shkreli has been previously accused of behaving erratically. In January 2013, according to court documents in a lawsuit, he engaged in a campaign of harassment against a former employee of Retrophin, a pharmaceutical company that Shkreli had started. Shkreli, as part of that alleged harassment, supposedly gained access to social media accounts of the ex-worker, contacted him, his wife and teenage son directly, and vowed to ruin the family while demanding the return of $1.6 million he claimed had been "stolen from me." "Your pathetic excuse of a husband needs to get a real job," Shkreli allegedly wrote the man's wife. "I hope to see you and your four children homeless and will do whatever I can do to assure this." Retrophin's board itself later ousted Shkreli, and in August sued him for $65 million, claiming he had looted the company to enrich himself and to pay off investors, whom he had allegedly defrauded, in a hedge fund he had run previously. Retrophin also disclosed it had received subpoenas from federal prosecutors in Brooklyn, a clear sign that authorities were interested in possible criminal conduct at the company. A month after being sued, it was revealed that Shkreli, at his new company Turing Pharamceuticals, had jacked up the price of the anti-parasitic drug Daraprim by more than 5,500 percent. Instead of ignoring reporters' questions about the price increase of the drug, which is used to treat people with toxoplasmosis, Shkreli embraced the publicity, speaking with The New York Times and other media outlets, and arguing that the price of $750 per pill was necessary and good business. "No," Shkreli answered when a CNBC reporter asked him on air he if would cut the price in light of the backlash over the increase. Shkreli has kept up media appearances since then, suggesting he would cut Daraprim's price, then avoiding doing so, then saying he would cut the price, but only for certain health providers. Last week, it was revealed that Shkreli bought a single-copy album of the hip-hop group Wu-Tang Clan for $2 million. He then said he didn't plan on listening to it anytime soon. On Thursday, the Securities and Exchange Commission unsealed a civil case against Shkreli, accusing him of orchestrating "widespread fraudulent conduct" from 2009 through 2014. "Well, that's pretty smart," New York City criminal defense lawyer Gerald Lefcourt said sarcastically about Shkreli's behavior in recent months. Lefcourt said that except in rare cases, where he believes it's important for clients to speak publicly to make their position known in the media, talking to reporters is something "that I almost never advise my clients to do." Lefcourt said that Shkreli's high-profile statements and actions in recent months "raise his profile to a degree that could be devastating to him if he ever has to face a judge at sentencing." "Your profile is so high that the court has to make an example for the public," Lefcourt said. "By raising his profile, he potentially worsens his situation."